INTRODUCTION: Bariatric surgery is often the only treatment option available to morbidly obese patients who have failed to maintain their weight loss by dietary restriction and exercise programs. Laparoscopica bariatric surgery acceptance has increased significantly, and have been reported as a safer alternative to open operations. In this study, we examined the trend in volume, cost, and hospital length of stay for open versus laparoscopic bariatric procedures. METHODS: The Premier Perspective™ Database (PPD) was used to estimate the incidence and costs of open versus laparoscopic bariatric procedures, annually, from 2005 to 2009. Our study focused on several ICD-9-CM procedures including 44.31 (high gastric bypass) and 44.39 (other gastoeneterostomy) for open bariatric procedures and 44.38 (laparoscopic gastroenterostomy) and 44.68 (laparoscopic gastroplasty) for laparoscopic bariatric procedures. RESULTS: Table 1 describes the trend in volume, cost, and hospital length of stay for open versus laparoscopic bariatric procedures from 2005 through 2009. The number of patients with open bariatric procedures decreased from 4,783 in 2005 to 1,705 in 2009, representing a decrease of 64 percent. The number of patients with laparoscopic procedures decreased slightly from 8,992 in 2005 to 7,916 in 2008; however, there was a 24 percent increase in the number of patients with laparoscopic procedures from 2008 to 2009. The mean cost per discharge for open procedures was significantly higher each year from 2005-2009. The mean cost for laparoscopic procedures was $13,460 in 2005 and decreased to $12,842 in 2009. The mean cost for open procedures ranged from $15,029 in 2005 to $23,187 by 2009. There was 5 percent decrease in the mean cost of laparoscopic procedures, compared to a 54% increase in the mean cost of open procedures from 2005-2009. Average hospital length of stay (LOS) was relatively constant at 2.6 days for laparoscopic procedures. Patients with open procedures had a significantly longer hospital LOS increasing from 5.3 days in 2005 to 9.2 days in 2009. CONCLUSIONS: The number of patients with open bariatric procedures decreased by 64 percent from 2005 to 2009 while laparoscopic procedures increased by 24 percent from 2008 to 2009. Mean cost per discharge for an open bariatric procedure was significantly higher than the mean cost per discharge for a laparoscopic bariatric procedure. 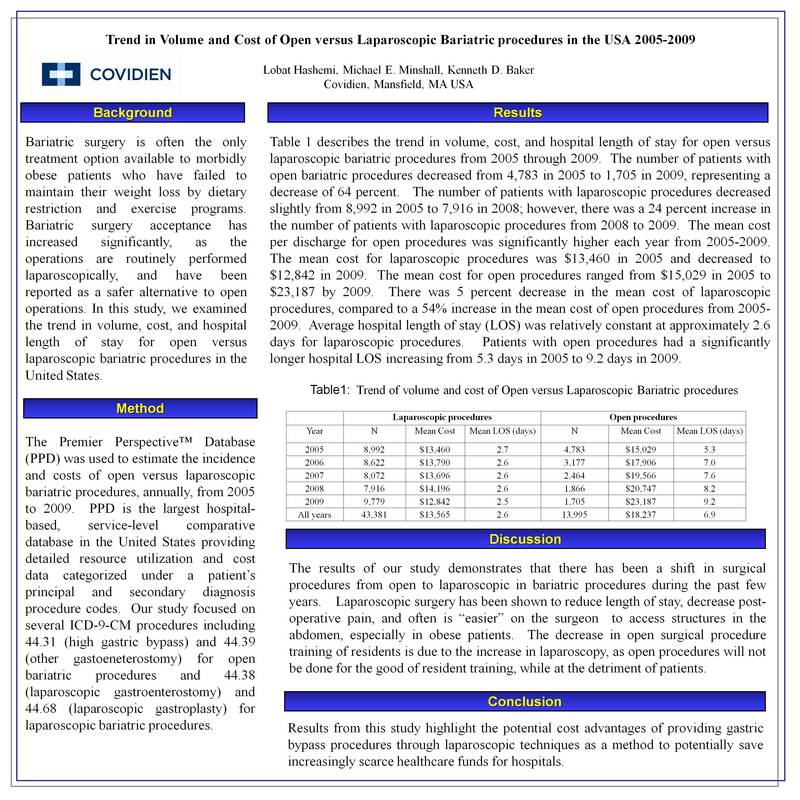 There was 5 percent decrease in the mean cost of laparoscopic procedures compared to a 54% increase in the mean cost of open procedures from 2005-2009. The mean hospital length of stay was also significantly shorter for patients with laparoscopic procedures compared to patients with open procedures. These observations highlight the potential cost advantages of providing gastric bypass procedures through laparoscopic techniques as a method to potentially save increasingly scarce healthcare funds for hospitals.